DUBLIN/LONDON – 18 July 2018. Global health tech company, SilverCloud Health today launched the first to market online therapeutic solution to address the global crisis relating to individuals caught in the vicious cycle of financial difficulties and mental health challenges. The Space from Money Worries programme, helps financial services to empower vulnerable clients to tackle the practical and emotional elements of financial difficulties. It is designed to target links between finances and mental health; helping individuals to learn the skills to challenge negative thoughts around finances, learn about avoidance behaviour and feel more confident about facing financial fears, including strategies to boost mood without spending and reduce impulse spending. The programme will be made available to SilverCloud’s UK healthcare partners, including 60% of NHS mental healthcare providers, organisations such as Bupa and Nuffield Health. It will also be made available to financial services institutions who are seeking to meet current and upcoming regulatory requirements to assist vulnerable customers. At a global level the problem of debt and mental health is well documented. In the UK alone, over eight million people are struggling with debt, yet only about 1.1 million receive debt advice, with no link being made to the role that their overall mental health can play in sustaining financial difficulties and vice versa. According to Citizens Advice, eight out of ten NHS mental health practitioners treating anxiety and depression also deal with their patients’ non-health concerns, which are most commonly debt and money problems. Research shows that those in debt are three times more likely to have a mental health problem. The UK Government has made a positive start to address debt and mental health, with the amendments to the Financial Guidance and Claims Bill, recently passed in the House of Commons, ensuring people under crisis care for mental health problems will not be pursued by financial institutions. Recent Money and Mental Health Policy Institute research highlighted a need for more clinical solutions to support people to change their patterns of thoughts and behaviours around money. The whose job is it anyway? report stated that ‘clinical interventions could help to provide a lasting fix to the vicious cycle of financial difficulty and mental health problems. In practice, however, this form of intervention seems very rare. 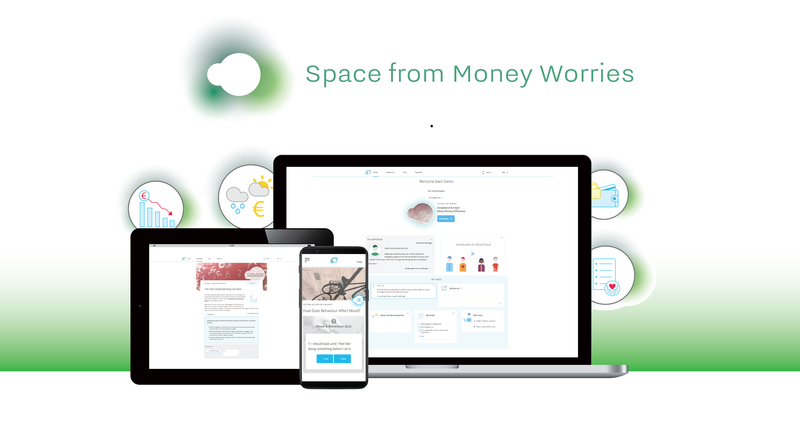 The Space from Money Worries programme was developed in collaboration with Dr. Thomas Richardson, a Clinical Psychologist who has published extensively on the relationship between financial difficulties and mental health problems. "Financial difficulties and mental health problems are often part of the same problem, but most support options treat them individually, offering debt advice separately from mental health help. So, for example, you might be offered a debt advice appointment but if you are so anxious you can't face it then it won't help. Space from Money Worries tackles the root psychological mechanisms which lead to the cycle of financial difficulties and poor mental health: the negative thinking patterns which prevent you tackling your debt, the worry and avoidance which stops you seeking financial help, the impulse spending which digs you deeper into a debt cycle." SilverCloud Health is a multi-award winning global health tech company; since launching in 2012 it has gone on to support 200 organisations across its global customer base, delivering a suite of over 30 clinically effective online programmes with user satisfaction of 98% and programme completion at 80%. Today, SilverCloud Health’s extensive library of evidence-based programmes address a broad spectrum of conditions such as stress, depression and anxiety as well as specific programmes for long-term chronic conditions (diabetes, COPD, and chronic pain). Over 15 years of academic research and clinically led randomised controlled trials (RCT) demonstrate SilverCloud Health programmes are extremely effective, engaging for patients and provide positive outcomes on a par with face-to-face therapy.